I've been thinking about last week's email... and the concept of arranging your albums not only alphabetically, but also relative-to-one-another-ly. Many people wrote back about their approach. Several folks mentioned the greatest "record" movie ever, "High Fidelity." In the movie John Cusack owns a record store and in one scene he is shown reorganizing his personal record collection. His sorting plan: autobiographically. He was rearranging his albums based on what was going on in his life the day he bought the record. A quote: "If you want to find 'Landslide' by Fleetwood Mac you have to know that I bought it for someone in the fall of 1983 and then didn't give it to her for personal reasons..." It's a wonderful movie. Meanwhile, here at the store Johnny B. has his Beatle albums under "B," but then further subdivided chronologically. And when he has multiple copies of the same record he has them again arranged chronologically based on which label variation came first. * In the late 1940s Les Paul was a well-known, established, successful guitarist and recording star. He was also a technical innovator, designing the world's first multi-track recording system. And he had long been a proponent of a solid-body electric guitar. He made his own by attaching an Epiphone neck to a 4x4 piece of pine. * Gibson's corporate head was turned as well. They saw the writing on the wall and they figured it was time to jump on the solid-body bandwagon. But they were an old, respected company, and they needed a respected artist to endorse their new guitar. So they turned to Les Paul. With his name on the headstock, they were not just following Fender's lead, they were creating a new, classy instrument... one befitting Gibson's long, rich heritage. * There are many opinions concerning Les Paul's personal contributions to the look of the new guitar. The general consensus is that Gibson's Research & Development Department designed the guitar, including the carved arched-top (because Fender didn't have any carving tools and could NOT make an arched top); and Les Paul designed the trapeze combination bridge/tailpiece unit and recommended the gold color. Here's a picture of John with a 1952 Gibson Les Paul. When discussing this instrument, though, most people fail to mention the companion piece that Gibson issued at the same time. In conjunction with the new solid-body, Gibson took another guitar from their line... the deep-body, hollow, single-cutaway ES-175... painted it gold and attached Les Paul's tailpiece, and called it the ES-295. Here's a picture of John with a 1953 ES-295. Notice the similar features to the `52 Les Paul. Here's John with both the Les Paul and the ES-295. In 1954 Gibson decided to offer a budget "student" version of the Les Paul. The new model was plainer and only featured one pickup. It was called the Les Paul Junior. Here's a picture of John with a 1954 Les Paul Junior. Again, it is rarely mentioned, but Gibson also introduced a companion hollow body, the ES-225. Here's a picture of John with a 1954 ES-225. Notice that like the ES-295 and the original Les Paul, it features the long trapeze bridge/tailpiece combination. Here's John with both guitars. In mid-1958 Gibson changed the Les Paul finish from gold to sunburst. Shortly afterward they discontinued its hollow brother, the ES-295. Also in mid-1958 the Les Paul Junior was changed to a double cutaway. Likewise, its brother (or is it sister?) ES-225 was discontinued. Of course, Gibson has produced many, many hollow guitars over the years. And for that reason, the ES-295 and ES-225 are usually categorized with the other hollow guitars. But this morning, by the time I was done brushing my teeth, I decided that we must correct this injustice! We must acknowledge their relatives! We must pull the 295 and 225 from the piles and piles of other Gibson hollow-bodies and recognize their relation to the Les Paul!!!! PS: The ES-295, the ES-225 and the 1952 Les Paul were the ONLY Gibson guitars to feature the Les Paul designed trapeze bridge/tailpiece. PPS: Although the 295 and the 225 kept this trapeze bridge/tailpiece throughout their life-span, the bridge on the solid-body 1952 Les Paul was changed by mid-1953. Why? Well, partially because of a design flaw on the part of Gibson's R&D department. When Les Paul gave them the part to be added to the new solid-body, the design department thought that the strings were supposed to wrap around UNDER the bar bridge. So they designed the neck angle on the guitar appropriately. By the time the guitar was in production it was too late to switch it around the correct way, with the strings going OVER the bar. Because of the way the guitar was designed, if you strung it properly the action would be far too high. The result of this error is that on a 1952 Les Paul it is extremely difficult to play over the bridge pickup. The bar of the bridge gets in your way. Here's a photo of the issue. That's why if you see a picture of Les Paul playing one of his signature guitars, even in 1952, you'll see that he has modified the bridge. PPS, Part 2: The ES-295 was designed correctly. The strings can be wound OVER the bridge bar, the way Les Paul wanted. Here's a photo of the ES-295 bridge. PPPS: In 1953 Gibson changed the bridge/tailpiece to a simple fixed bar. Here's John with a 1953 Les Paul. PPPPS: The 1952 Les Paul pictured above is from late-1952. The very first Les Pauls, from mid-1952 had two slightly different features: they did not have binding on the neck and the mounting screws on the bridge pickup (only) were in diagonal corners of the P-90, rather than in the center. Here's a picture of John with one of the first Les Pauls ever made. Here he is with both, the super-early mid-1952 Les Paul and one made a few months later, in late-1952. The 2nd Annual "Rock For Autism"
Lots and lots of raffled and auctioned items!! 100% of the proceeds go to "Autism Speaks!" PPPPPPPPS: Customer of the week: Dancing Queen! As Pittsburgh Guitars enters its 30th year, several folks have asked me if I've grown tired of it. Well, occasionally "yes"... but almost every day something happens that entertains me. Later that day a gentleman came in with his 1957 Gibson L-50. He got it brand new when he was a child and he hadn't played it for the last forty-seven years. He's thinking about starting again (which we encourage!) so he wanted to get it re-strung. (The L-50 is a non-electric, non-cutaway, archtop acoustic guitar... It looks like this.) As we were writing up his repair tag we started to discuss the value of this instrument vs. others from the same time period. Now that we are familiar with the concept of a "collectors item," can WE predict the future? Yeah, it's easy to look back to the 1950s and say, "Oh, if only they would have done this or that..." But that would have required them to look AHEAD, and that's the hard part. There may be a guitar hanging on the wall of Pittsburgh Guitars today that will have house-buying value in the future. But I'll be darned if I know which one it is. So, it was fun to look at this guy's old L-50 and try to imagine him walking through the door with a `57 Les Paul instead (598 shipped in 1957...), but we're living in the future of the past, and the future is impossible to predict. PS: I couldn't help myself with that "future of the past" phrase... but it's not only pseudo-deep, it's also accurate. Feel free to quote me! PPPS: On a different topic, I just finished reading an interview with Mike Campbell from Tom Petty & The Heartbreakers. On their last tour, including a performance at last year's Super Bowl, they appeared to use six Vox Super Beatle amps. It turns out that the Super Beatles were just for show. Here's a side photo of his amp set-up. He really plays through two small Fender amps! 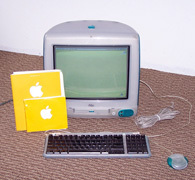 PPPPS: Hey, back-tracking to the free iMac from the "PS," I also have a bunch of new pro VHS tapes that I used to use with my video company, Worldwide Filmworks. They are also free. 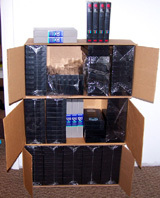 Do you know anyone who needs unused VHS tapes? Did I mention FREE?? For more info contact John or visit the website. Years and years ago (1986, to be exact) I had a weekly radio spot on the Jimmy & Steve Show ("Jimmy & Steve in The Morning, Sometimes They're Funny, Sometimes They're Boring") on WMYG-FM, "Magic 97." My segment was called "Carl's Record Corner" and I'd play wacky songs from my album collection. Like William Shatner doing "Lucy In The Sky With Diamonds"... or Mae West 'singing' "Twist & Shout." Sometimes I'd have contests: "What was significant about the American Top 40 chart on April 4, 1964?" or, "What is the next line in this song: Hoss & Joe & Adam know, every rock and pine...?" As a member of the Magic 97 radio family I would sometimes participate in promotional events. At one event I said something that Steve Hansen laughs about to this day. I was invited to a WMYG-hosted golf outing. I had never played golf before, but my first shot wasn't bad. My follow-up shot, however, went straight into the woods. The ball was obviously lost. I looked at Steve and said, "Oh, man, good thing I brought a second one!" He fell over. It then dawned on me that I should have brought two DOZEN balls! But I hear that it's fun. So.......... It took us twenty-nine years, but we're going to have our first Pittsburgh Guitars Golf Outing. Here's what I know so far: It will be on Sunday, August 17th. There will be six tee times, staring at 11 AM. And it will be a "scramble." Oh yeah... and there will be prizes, food and alcohol. Meanwhile, here's a list of the best famous-musician-golfers, compiled by Golf Digest magazine. I know, I know, golf is kind of an odd activity for me to suggest, but you know I like to try new, experimental things... And I hear this is golf thing catching on. PS: We'll see you this Sunday!!! The Second Annual "Rock For Autism"
Lots and lots of great raffled and auctioned items!! Visit their website for more info or email John. PPS: One of my favorite Carl's Record Corner segments: I played a track from an actual album that I own called "The Best Of Marcel Marceau." You put the needle in the groove and all you hear is silence... for the entire side of the LP. Then, at the end, applause. PPPS: Hey, if you know the answers to the above two questions in the first paragraph, send `em in. We'll randomly pick a winner from the correct replies and the winner will get some sort of yet-to-be-determined prize! The NAMM Show opened bright and early the next morning, and I began my quest to find more cool stuff to carry here at Pittsburgh Guitars. The first thing that caught my eye was a reissue of the Kay Thin Twin "Jimmy Reed" guitar. I ran over to the booth to check it out. Here are some pictures of the newly revived Kay line. The owner of the company welcomed me and said, "There has been a lot of interest in these. Look! We got a nice mention in 20th Century Guitar Magazine..." and he handed me the July issue. Here's the cover. Yep, right on the cover, next to the Kay guitar... Vince Gill. I smiled, ordered a few of the guitars (estimated delivery: August) (which probably means October...), and moved on to visit with our other vendors. As we were ordering new Martin guitars, we told our Martin sales rep about our upcoming golf outing. He said he'd like to play, and he had a gift for us: some Martin golf balls. He gave us the golf balls, and as we were thanking him, guess who walked into the booth? Yep, Vince Gill. At this point we figured that we may as well stop and talk to Vince. It turns out he really *IS* a nice guy. Here's a picture of Vince Gill signing a Martin golf ball with John. We were going to invite Vince to our golf outing, but we figured he'd win all of the prizes and there wouldn't be any left for YOU. He says "Hello" to y'all. Speaking of new products from the NAMM show, we just received the new Danelectro guitars, and I think it will be interesting to see how well they do in the market. In fact, I'd like to get your opinion with a quick survey. And to make it fast and easy, you only have to reply with answer "A," or "B." Danelectro's newest guitar is the "63 Dano," a reissue of a two-pickup, double-cutaway guitar first issued in 1963. Here's a picture of me with an original 1963 that I keep beside my bed. In the 1960s this model came with a small amp built into its case. The new ones don't have the amp-in-the-case option, but they are very nice repros. There is regular six-string, a baritone, a short scale bass, and a long scale bass. Here's John holding a couple of them. Now, here's what has been rattling in my brain: We sell a lot of "reissue" guitars. For example, the Fender 1962 Reissue Stratocaster is always a big seller. So is the 1952 Reissue Tele. Hofner Reissue Basses, most Reissue Gretsches, and all Reissue Rickenbackers also sell fast. Danelectro's last guitar, the Jimmy Page version, quickly sold out. So, you would think that this guitar will do well, too. HOWEVER, what all of the above guitars have in common is that they are models that most of us could not afford (or at least find!) when we were younger... The new "63 Dano" is a reissue of a guitar that WAS readily available, and easily affordable, when it was first issued in the 1960s. I know from experience that we like to buy things that "we always wanted." For example, as a kid I looked at the Sears Catalog every day, and I always liked the brown sunburst Silvertone (made by Danelectro) Model 1442 Bass. So, when I had a chance to buy one years (and years!) later, I did. And I love it, and I will never sell it. (Here's me with the bass.) BUT what about an instrument like the new Danelectro, that falls into the "I had one of those when I was a kid" category? "A" - I understand your concern. This model will not sell as well as other reissues. People are more inclined to buy a reissue of something they have "always wanted" rather than something that they either already owned, or could easily have owned. "B" - Even if you had one as a kid, this model has always been fun to play... And most people have long since sold, traded, or given away their original one. This new reissue gives folks a chance to re-live their youth. And that's good!! It will sell as well as any other reissue! A lot of old Danelectros have come through the store over the years, and generally we don't keep track of where they end up. But I do know who has one of ours. It all goes back to Pittsburgh Guitars' first day, May 22, 1979. One of my first customers was someone who would become a lifelong friend, Paul Buriak. He was funny and wacky and always full of joy. And he loved guitars. Paul would visit almost every day and it was always an experience. In addition to sharing an interest in instruments, we also had similar tastes in music. 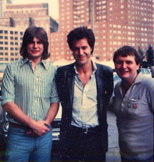 So, when The Kinks came to Pittsburgh on their 1980 tour, we both went. After the show Paul asked around, found out where the band was staying, and he suggested we hang out in the hotel bar. And we did. Sure enough, a few minutes later we met one of my heroes, Ray Davies. Thanks to Paul's charismatic personality, we all became fast friends. When the bar closed Ray took us up t o his room where he opened a bottle of champagne and we talked more about music and guitars. Ray said he often wrote songs on the road, and Paul told him that he needed a Danelectro Silvertone with the amp-in-the-case, so he could plug-in in his hotel room. Ray said he loved the idea. Paul said there was one for sale at Pittsburgh Guitars. Ray offered to buy it, but I ended up giving it to him... it was the least I could do for all of the happiness that Ray's music brought to me. I took it to him the next morning before the band left town. Here's a picture of me, Ray and Paul. The next time I talked to Ray he said that he actually used the guitar to write some songs for The Kinks' next album. Several months ago, as I was having lunch with Paul, we talked about the Pittsburgh Guitars web site. I told him that I really liked our site, and we get lots of compliments on it, but I wished we had a place to put up more pictures and videos. He suggested an additional site that would be more fluid. We could change pictures and videos every week. It could also display weekly band posters, and be a place to house the entire history of the Pittsburgh Guitars Email Special. And he said he'd love to contribute with a blog, featuring links to interesting music sites. Over that lunch, we formulated Carl's Guitar Corner, which has been lots of fun. The unfortunate thing about life is that it does not go on forever. Sadly, last month Paul passed away. He was a true friend of mine and true fan of Pittsburgh Guitars. We miss him every day. We still have a link to his blog on the home page of CarlsGuitarCorner.com. He was proud of the blog, and added to it every day. We have left it exactly as he left it. He was a good guy. 1) "What was significant about the American Top 40 chart on April 4, 1964?" - The top five songs on the chart that week were by The Beatles. 2) "What is the next line in this song: Hoss & Joe & Adam know, every rock and pine...?" - "No one, works, fights or eats, Like those boys of mine." We randomly chose a winner from all of the replies: Congratulations to Michael B. He wins a prize package (also randomly chosen) of this fun Martin stuff. PPPS: My favorite reply to last week's email came from Kenny W. I mentioned an album I have called "The Best Of Marcel Marceau," which is entirely silent... (up to the applause at the end.) Kenny wondered if it was available on CD, where it would be even MORE silent! PPPPS: If you'd like to sign up for the First Annual Pittsburgh Guitars Golf Outing, contact me or John. It'll be lots of fun and since it's a scramble you don't have to be any good (I'm not!). There will be food, drinking and prizes! Sunday August 17th.